Coconut oil is one of the healthiest foods on earth. It’s packed with fatty acids and powerful medicinal properties. This natural, non-toxic oil has numerous benefits and uses, making it a must-have for people trying to streamline their life. Instead of having different products for each need, coconut oil gives you multiple solutions in one, making it pocket-friendly. Here are 10 fantastic ways to use it. Coconut oil can be used to remove labels as well as sticky residues from glass, wood, and plastic. Mix baking soda with coconut oil. Rub the solution onto the surface with a rag until the label is removed. Then, wipe clean with a dry rag. Whether you want to clean a leather jacket or shoes, all it takes is a small amount of coconut oil. Simply rub onto the surface to clean. Let it sit for few minutes so it penetrates the material. Then, wipe off excess with a cleaning cloth. Apply coconut oil to door hinges. Open and close the door a few times. Let the oil sit on the hinges overnight and wipe off any residual oil in the morning. Squeak is gone. Coconut oil can be used to polish wooden furniture, making it look like new. Simply use alone or mix with lemon juice and vinegar. If you choose the latter, you will need to repeatedly mix or shake the solution. Coconut oil can be used as a makeup remover. It’s cheaper and gentler than store-bought makeup removers and facial wipes. It’s also organic, moisturizes the skin, and can even remove mascara. This method involves swishing a tablespoon of coconut oil in your mouth for up to 20 minutes. (Start with shorter amounts of time and build up.) Note that you should practice oil pulling in the morning on an empty stomach. This method is known for whitening teeth and improving oral health. Are you running out of lip balm? Are your lips are too dry and nothing seems to hydrate them? Apply a small amount of coconut oil and voila, your lips are smooth again. Cleaning your makeup brushes is crucial. This process can get easier and more effective with this DIY: Mix 3 tablespoons of lemon juice with 2 tablespoons of coconut oil. Then swirl your brushes in this mixture. Remember, clean makeup brushes are one of the keys to clear skin. Saturate your hair with coconut oil and cover it with a shower cap. Let it sit for an hour then wash and condition as usual. This treatment conditions dry hair, prevents hair breakage, and enhances hair growth. Do this at least once a week for better results. Add an essential oil of your choice to coconut oil. The oil heals and nourishes skin, relieves pain and makes skin soft and smooth. 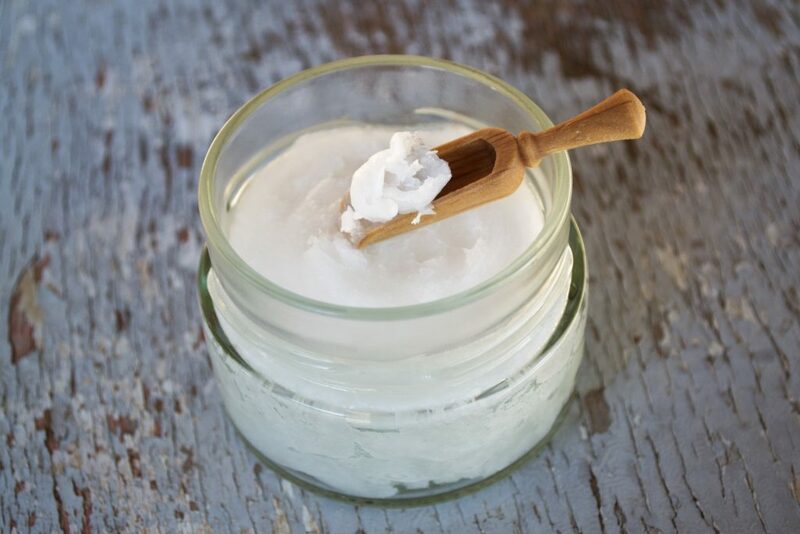 Do you have favorite recipes and uses for coconut oil? What are they? Ghada Bounouh is as a nature lover who believes it’s her duty to preserve the environment. She says no to toxic personal-care products. Instead, she encourages the use of organic, cruelty-free products. You can follow her on her website, Facebook, and Instagram. Jumping for #Sustainable Work Pants!